After looking at what it costs to have any BMW mechanic change the oil on my F650 I knew that I would be doing this myself. $100 twice a year really just isn’t worth it. It really isn’t THAT difficult, though, BMW doesn’t exactly make it easy either. Originally Posted to f650.com by Joe M.
with photos and some extra comments by Austin. Replacing the engine oil and filter on an F650GS is not difficult if you know exactly what to do. These instructions presume no special knowledge or skills, and will walk you through the procedure in detail. Your BMW dealer will sell you a kit containing the parts you need for about $10.00 (filter, rubber o-ring, crush ring for oil tank, copper ring for drain plug). (my kit from the BMW dealer cost was around$20 including oil) Your bike’s toolkit will contain all required tools, except for a socket for the drain plug (24 mm, or 15/16″), and a torque wrench. If you do not have a torque wrench, try to borrow one (Pep Boys lends tools to customers). 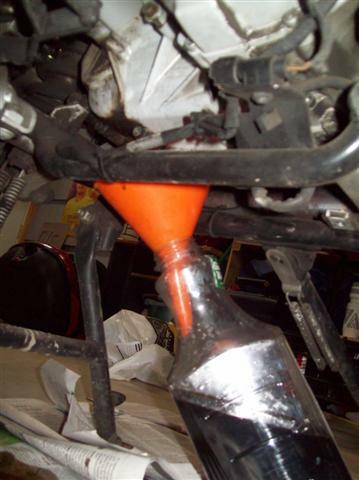 If you cannot borrow one, you should still be able to do the oil change; just be sure not to overtighten things. There are three discrete areas that need attention. Oil drains from each one. They are (1) the oil tank; (2) the crankcase; and (3) the filter housing. 1. Place bike on centerstand. Start the bike, allow it to reach operating temperature (the fan should cycle on.) [Ed: Or, you might actually RIDE it.] Turn bike off. 4. Six of the seven torx screws are removed, and one is loosened. Remove the following: the left-most screw that is exposed when the seat is removed, the screw at the front of the “gas tank” slightly forward of the black filler cap, and the four screws that go through the silver-colored plate to which the left front turn signal is attached. When these last four are removed, the turn signal will hang. That’s OK.
5. The seventh screw, which merely needs to be loosened, is underneath the panel, about an inch behind the rear-most portion of the front beak-like fender. 6. Remove the oil filler cap. The panel can now be lifted up and off the oil filler neck. There is a relatively tight force-fit between the panel and neck, just use gentle pressure and it will come off. 7. The black oil tank, which has fins built in, is now visible. The tank needs to be removed from the bike so it can be tilted, to enable a complete draining. 8. First, loosen the bottom-most bolt on the tank. (It is a hex-head.) This is a drain bolt. You want to loosen it and then re-tighten it finger tight so that it can be removed without too much difficulty once the tank is off the bike. 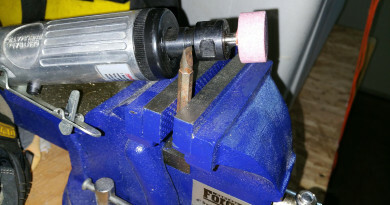 Remove the semi-circle clips with a screw driver. there are two of them. 9. 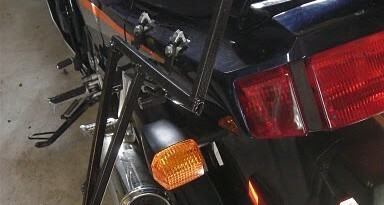 The tank is attached to the bike at three places: one is a bolt, the other two places are semi-circle clips. Dislodge the clips using a screwdriver. Then remove the uppermost bolt, which holds the tank against the air-box. The oil tank should now be free from the frame. This is the old oil drain screw crush washer. As you can see, it is crushed. 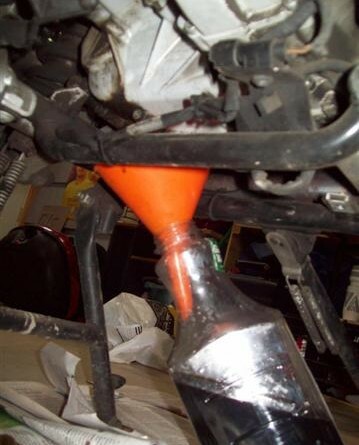 Note the awesomeness that is hanging the funnel from the oil hose. This will save you a lot of mess. 11. After the oil has drained, reattach the tank to the frame. Tighten the upper bolt to 9 nm. (Or if doing this by feel, “not too tight, not too loose) Then replace the two clips. The drain bolt must be replaced, using a new crush washer that comes with the kit. Tighten the bolt to 21 nm, which is fairly tight; the washer will actually be “crushed,” hence its name. 12. Slide the previously removed body panel over the oil tank filler neck, engage the panel into the middle panel that is still on the bike, and replace the six torx-head screws. Tighten up the screw that was merely loosened, making sure the panel is engaged on top of it. Then replace the tank cap so stuff doesn’t land inside the tank while you work on the other two areas. Bash plate to be removed. There are 3 bolts. 13. Remove the bash plate. That is the silver (apparently aluminum) plate at the very bottom of the frame, containing three triangular holes. 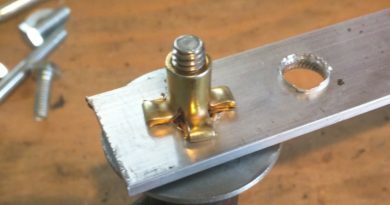 The plate is attached to the frame with three torx bolts. Remove all three, and then remove the bash plate. 14. The drain plug is at the very bottom of the crankcase, in the middle. (There is a similar looking plug off to the side. Leave that alone. The drain plug should have a black label saying “Made in Italy” and “magnetico” or something like that.) This bolt is usually pretty tight, and also pretty awkward. I crushed my thumbnail against my foot peg the first time i took this bolt off. I recommend caution, and maybe using your foot. Crank case bolt to be removed. This is the crank case bolt that is removed. 16. While the oil is dripping, clean off the drain plug, and especially the little metal filings that have adhered to the “magnetico” portion of the plug. I am not sure there is a way to do this without making a mess. If you have one, let me know. Reattaching the bash plate. A torx socket and ratchet is helpful here. 18. Reattach the bash plate, using the three bolts. The torque is 9 nm. If you get tired of turning that torx wrench. a power driver set on the most delicate setting can be helpful in quickly removing the screws. Careful not to damage the plastic covers!!! 19. To access one of the bolts on the oil filter housing, you need to remove the plastic sprocket cover. This is the item that says “650” on the right side of the bike. There are three torx bolts attaching the sprocket cover to the bike. Two are on the bottom, and one is recessed, going right through the cover. Remove all three bolts and the sprocket cover will come off. Oil filter cover and the black wire just to the left and beneath it. 20. The oil filter cover sits right above the sprocket cover. It is circular and is about 4 inches in diameter. 21. Before removing the oil filter cover, dislodge the black wire underneath it, first studying how it is routed. This is the neutral indicator wire. It should be dislodged because oil is going to spill out of the filter housing when you remove the cover, and you should avoid dousing that wire with oil if possible. Oil filter cover removed, and the oil filter inside. This part is going to be messy, again, I havent yet found a way around this. 22. Remove the three torx bolts that are equidistant around the perimeter of the oil filter cover. As you are loosening the third one, oil should start leaking out. BMW sells a tool that engages on the frame and supposedly directs the flow of oil neatly into your receptacle, but I have yet been able to get a hold of it. (Tool no. BMW 11 7 511). Anyway, remove the third bolt and pull off the cover. Oil filter cover and oil filter removed. 23. After sopping up the errant oil, remove the filter by pulling it straight back. (You may have to use a tool to encourage it to leave its home.) After the filter is removed, clean the filter housing using a clean, lint free cloth. Showing the oil filter cover. Note the black rubber O ring on the outside of the filter cover. This will be replaced. 24. Inside the filter cover is a black rubber o-ring. Pry it off with a screwdriver. Coat the new o-ring with fresh oil, and insert the ring into the cover. Putting the new filter in the filter housing. There is only one hole in it, so it should be obvious which way it goes in. 25. Press the new filter into the filter housing. The hole in the filter, of course, must face the bike. There is a protrusion onto which the filter will seat. 26. Reattach the filter cover using the three bolts. The torque spec is a not-too-tight 10 nm. 27. Re-route the neutral wire as you found it. 28. Re-attach the “650”- emblazoned sprocket cover. The spec is a hand-tight 2 nm. Filling up with new oil. 30. Add another .3 liters of oil. 31. Replace the seat. Replace the “glove compartment” cover. 31. In order to get proper readings from the sight glass, you need a good ride of a few miles to get things circulating and settled. You may find that you need to add another .1 liter if you like the oil to be at the maximum of the sight glass, rather than in the middle. All finished and clean. a job well done! Best direction on the net. Thanks man!